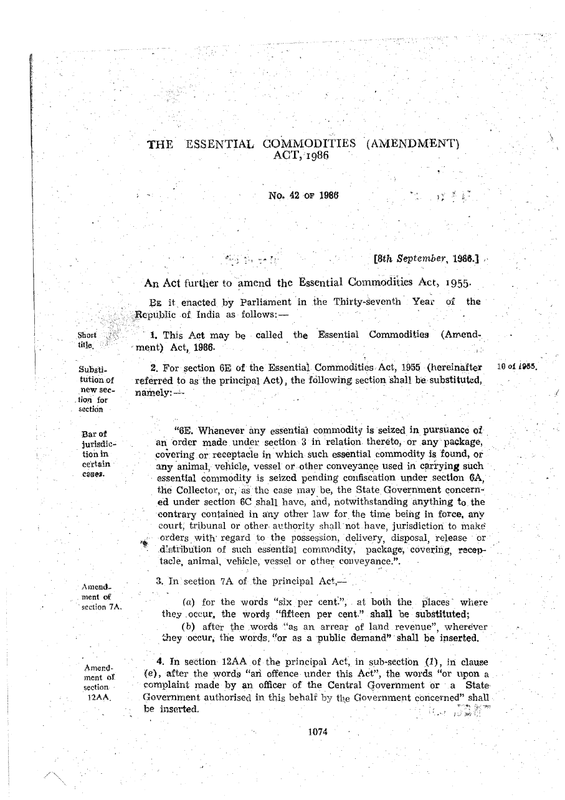 This Act may be called the Essential Commodities (Amendment) Act, 1986. "6E. Bar of jurisdiction in certain cases.- Whenever any essential commodity is seized in pursuance of an order made under section 3 in relation thereto, or any package, covering or receptacle in which such essential commodity is found, or any animal, vehicle, vessel or other conveyance used in carrying such essential commodity is seized pending confiscation under section 6A, the Collector, or, as the case may be, the State Government concerned under section 6C shall have, and, notwithstanding anything to the contrary contained in any other law for the time being in force, any court, tribunal or other authority shall not have, jurisdiction to make orders with regard to the possession, delivery, disposal, release or distribution of such essential commodity, package, covering, receptacle, animal, vehicle, vessel or other conveyance." (b) after the words "as an arrear of land revenue", wherever they occur, the words "or as a public demand" shall be inserted. In section 12AA of the principal Act, in sub-section (1), in clause (e), after the words "an offence under this Act", the words "or upon a complaint made by an officer of the Central Government or a State Government authorised in this behalf by the Government concerned" shall be inserted.